For the discerning audio enthusiast, compromise is not an option. With that in mind, we present the Creative ZiiSound T6, a premium 2.1 speaker system which delivers high-quality wireless audio seamlessly and effortlessly, anywhere in your home. Be it music, movies or games, hear all the details and subtleties from high-grade drivers that combine with the precision-tuned Symmetrically Loaded Acoustic Module (SLAM™) subwoofer for all-out resounding bass. Swivel the satellites for an instant wireless surround sound experience in stunning realism. Pair the ZiiSound T6 with any stereo Bluetooth-compatible device and enjoy instant wireless music from mobile phones, notebooks and even Creative’s very own ZiiO entertainment tablets. It has the power to entertain in many more ways too, with multiple connection options. Connect it to an HDTV for the ultimate home cinema experience, or watch videos online simply by hooking it up to your desktop or notebook PC. The ZiiSound T6. 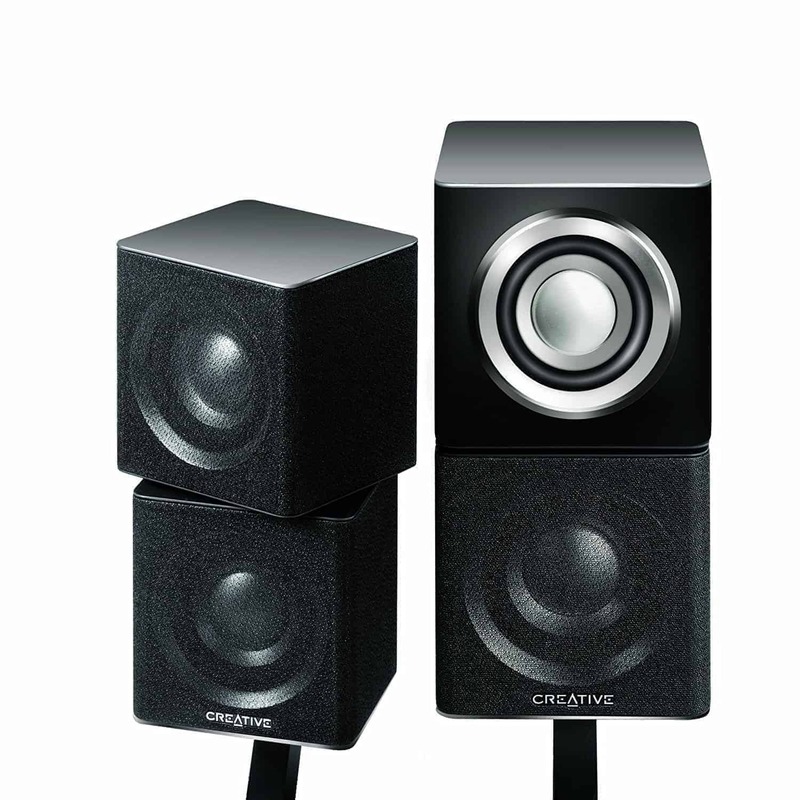 The definitive speakers your entertainment deserves. Enjoy seamless quality sound from just about every compatible stereo Bluetooth device without the hassle of wires. ZiiSound T6 connects wirelessly and quickly to your iPhone, portable media player, notebook and even the Creative ZiiO entertainment tablet. With the included Creative BT-D1 USB transmitter featuring Bluetooth and aptX™ technology, transmit high-fidelity stereo sound wirelessly from your desktop or notebook PC or Mac. No additional drivers needed – simply plug and play! 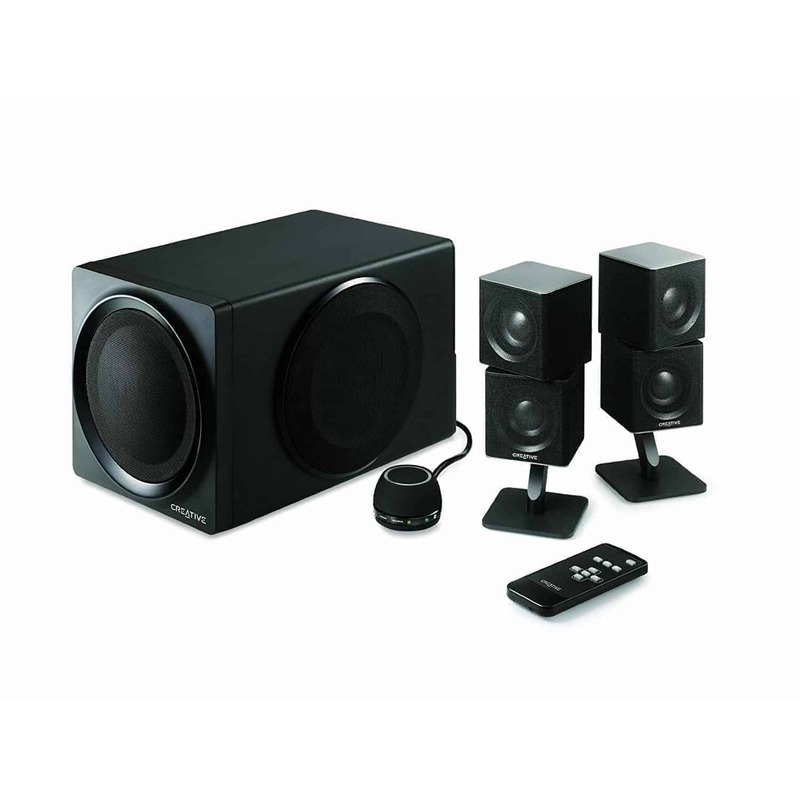 Enjoy realistic surround sound for your favorite 5.1-encoded movies, games or music when you plug the speakers via a USB connection1. The aptX audio codec provides you with superior Bluetooth stereo audio. 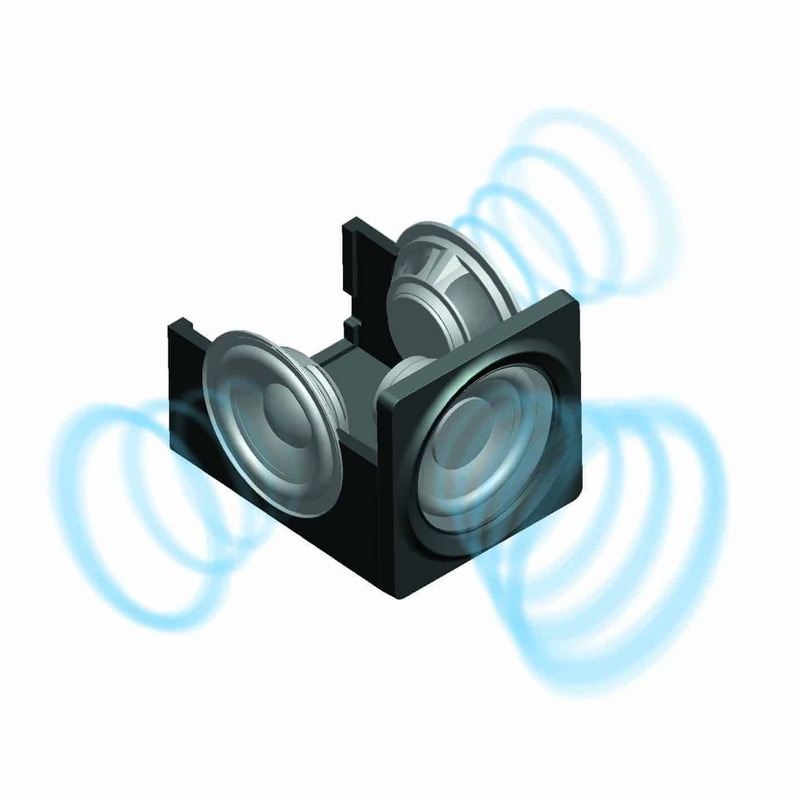 Featuring an innovative Swivel-Speaker-Array design, effortlessly switch from stereo to surround mode by rotating the top portion of each satellite speaker. Two high-end drivers on each satellite bring you full-bodied mids and soothing highs for a pleasant all-rounded music experience, perfect for the audio enthusiast in you. The precision-tuned, powerful Creative SLAM™ subwoofer brings you realistic heart-thumping lows for a completely engaging gaming or movie experience. 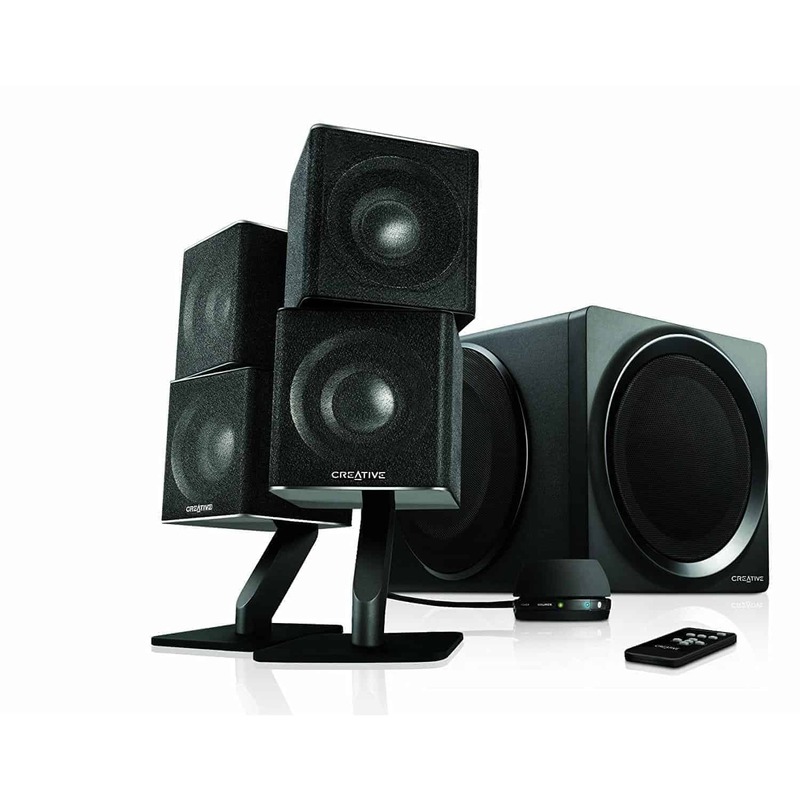 The versatile ZiiSound T6 can also be wall-mounted, ideal for using it as TV speakers in the living room. Simply remove the detachable satellite desktop stands and they’re ready to be mounted (brackets not included). The handy all-in-one digital control pod lets you have easy access and control over the speakers’ functions. Select the audio source (Bluetooth, USB or AUX-in) and adjust the volume. For private listening, you can also output audio to headphones. 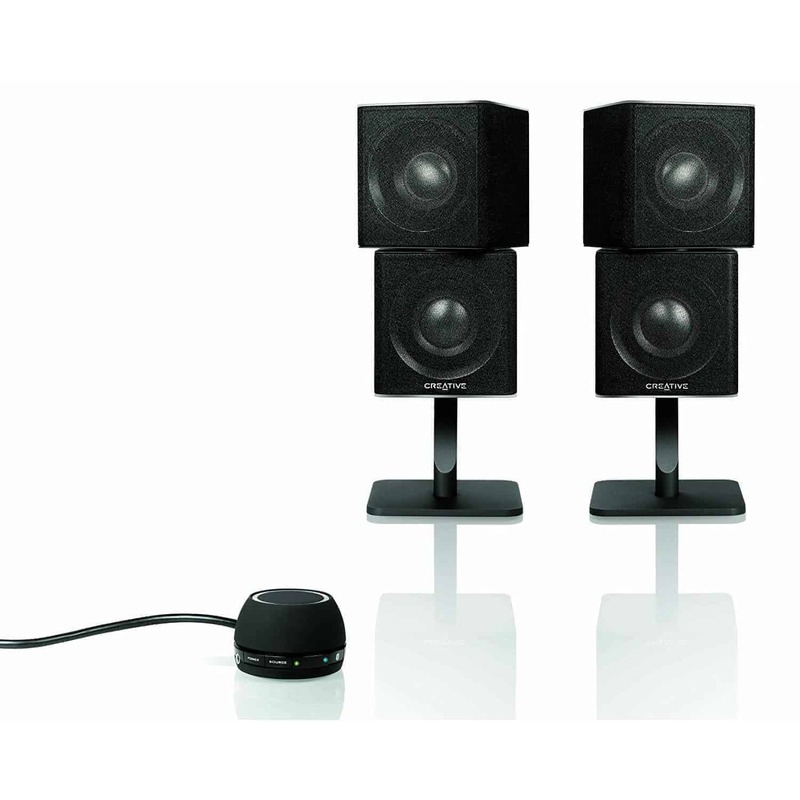 Access your ZiiSound T6 speakers from across the room with the included IR remote. Control the audio source, volume, playback or power on/off the system with ease. While it works seamlessly with any compatible stereo Bluetooth device and your computer, the speaker system also allows for a wired connection with other portable devices, such as MP3 players, via the AUX-in port on the digital control pod. Simply plug the included Creative BT-D5 Bluetooth transmitter into your iPhone or 30-pin iPod2 to give it Bluetooth and aptX capabilities for pristine music playback. 1 5.1 decoder software is required and is usually available with popular DVD software. 2 The BT-D5 is compatible with iPod touch (1st, 2nd, 3rd and 4th generation), iPod classic (this refers to the 6th generation iPod or later), iPod nano (3rd, 4th 5th and 6th generation – iPod nano 5th generation’s radio feature not supported), iPhone, iPhone 3G, iPhone 3GS and iPhone 4.